Every year the University of Detroit Mercy students take part in a national contest named “Ethics Bowl” The Ethics Bowl is inspired by TV’s College Bowl, but modified rules adapt the game to the subject of ethics. In Ethics Bowl, a moderator poses questions to teams of three to five students. Questions may address ethical problems on classroom topics (e.g. cheating or plagiarism), personal relationships (e.g. dating or friendship), professional ethics (e.g. engineering, law, medicine), or social and political ethics (e.g. free speech, gun control, etc.). Each team receives a set of ethical issues in advance of the competition, and questions posed to teams at the competition are taken from that set. A panel of judges rates answers in terms of intelligibility, focus, depth, and judgment. No specialized knowledge in ethical theory is required to compete in or judge an Ethics Bowl. The competition is one of the few events at Detroit Mercy that draws participants from virtually every part of the University. 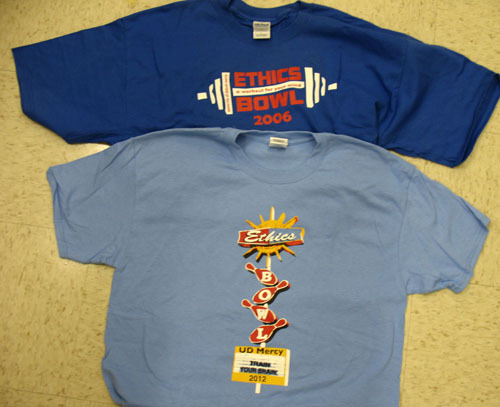 Many students who initially compete for extra credit in a course are surprised at how much they enjoy Ethics Bowl, and often enthusiastically return to compete in subsequent years. Judges and moderators are drawn from faculty, staff, administration and alumni, many of whom return every year. Plus, the first-place team has the honor of representing the university at a regional Ethics Bowl and may go on to compete in the national Intercollegiate Ethics Bowl, which takes place at the annual meeting of the Association for Practical and Professional Ethics in February.